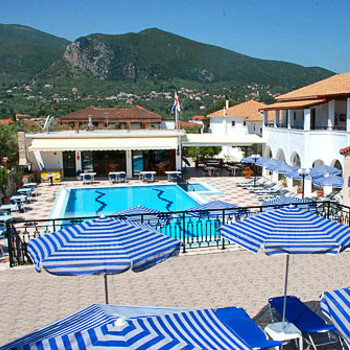 You can expect a weekly barbecue and quiz at this sociable base as well as a friendly pool bar. The people you see collecting your empty glasses and generally looking after you are George and Adriana and they are great at ensuring a friendly atmosphere. George, Andriana and Angela were very welcoming and fantastic people, who were always happy, and made you feel like a friend. Fantastic self catering accommodation which is very clean and a good distance back from the resort centre, so you could enjoy a peaceful nights sleep. Andriana cooked fantastic fresh meals. I suggest if people are worried about there not being a telephone or television then perhaps you shouldn't stay in this accommodation. However, if you are a couple looking for a get away from it all holiday without the urge to watch television, or need to use the land line phone, and experience the true Greek holiday then Potamitis is the place for you. Me and Ross cannot wait to return again, and will 110% be staying here, no doubt about that. Stayed at the Potamitis, Alykes. Would never return there although we love Alykes. Owner very mean and miserable, too much noise caused by barking dogs and crowing chickens. Only two changes of towels a week, no welcome pack or free cold drink on arrival. No television or telephones or ironing facilities. No entertainment at all unless one prefers constant 70's music which the owner loved and he did not care what anyone else liked. Owners wife looked totally worn out because she did all the work around the place. The place is completely boring! Never ate there or spent any time there on principle because we could not stand the owner. I stayed here for two weeks, on arrival George was very friendly and inviting. On our second day we were made to feel unwelcome by George and another couple because of an incident on our first night that we got the blame for, as a result we did not eat at the restaurant or use the pool. As far as we were aware there was no entertainment at all. The rooms were nice and the cleaner came in everyday, just a pity about the host and hostess. We would never consider staying at the Potimitis Studios ever again. The Potamitis is a fab place to stay and its all down to george and adrinia the owners making you feel at home. The rooms are spotless and cleaned every day. The pool area and bar are lovley and a great place to relax and with the resort centre and beach only a gentle 10/15 mins stroll away with a mini mart a little nearer. Have stayed here 4 times now and can't get enough of the place. The studios are clean, bright and all have a terrace/balconey and are cleaned daily. The pool and pool area are spotless and there is a shower for you to use before going into the pool. Adriana, George's wife (owners), does all the cooking. they do breakfasts ranging from tea and toast to full English, lunches and evening meals. All meat used in cooking is fresh, not frozen! It's a 10-15 minute stroll into resort. George and Adriana are very friendly and can't do enough for you. There is a bar as well selling all the usual drinks. Potamitis studios have won best small and friendly gold medal for the past 6 years. I would recommend the Potamitis to anyone, young or old. A truely great place! Would I go back again? You can bet your life would!!! !